Are you ready to get your learning on about the Physical Principles of Respiratory Care? If so then you’re in the right place, because that is what this study guide is all about. 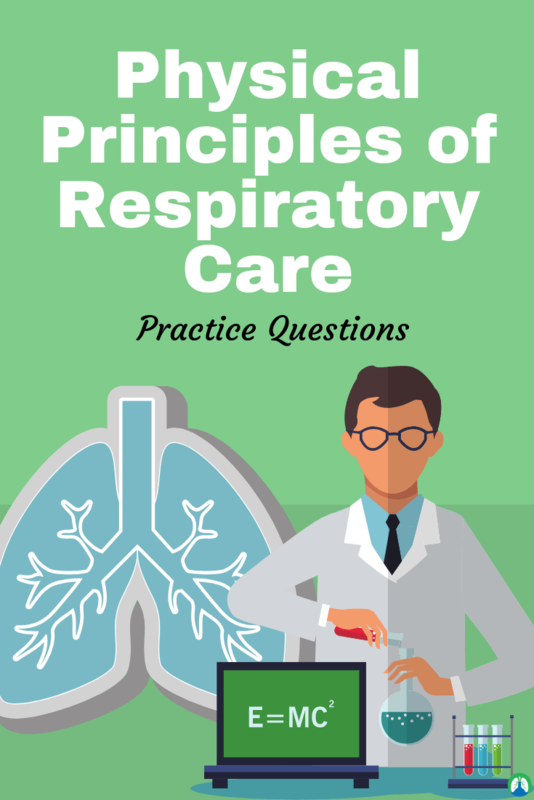 The practice questions listed for you below can help you gain a great understanding of the physical laws and principles that are used in Respiratory Care. If your Respiratory Therapy school is like mine, then you probably use the Egan’s Workbook. Don’t get me wrong, it’s a really good workbook that can definitely be helpful at times. The problem is — it takes way too long to look up all the answers. It can be more trouble than it’s worth. 1. What is absolute humidity? The mass of water vapor contained in a certain volume of air. 2. What is absolute zero? The attractive force between unlike molecules. 4. What does ATPS stand for? 5. What is Avogadro’s Law? Equal volumes of gases contain the same number of molecules. 6. What is the Bernoulli effect? Fluid passing through a tube that meets a constriction experiences a significant pressure drop. Fluid that flows through the constriction increases its velocity while the lateral wall pressure decreases. Heating a liquid to a temperature at which its vapor pressure equals atmospheric pressure. 8. What is buoyancy in liquids? Occurs because the pressure below a submerged object always exceeds the pressure above it. 9. What is Boyle’s Law? The volume of gas varies inversely with its pressure. 10. What does BTPS stand for? 11. What is the calculation to convert Celsius to Fahrenheit? 12. What is Charles’ Law? The volume of gas varies directly with its temperature. It is the attractive force between like molecules. Change from gas to liquid. Transfers heat in liquids and gases. 17. What is the calculation to convert Celsius to Kelvin? 18. What is critical temperature? The temperature above which the substance cannot exist in the liquid state. 19. What is Dalton’s Law? The partial pressure of a gas in a mixture is proportional to its percentage in the mixture. 20. What is the density of a gas? The ratio of its mass to its volume. 21. What is the dew point? The temperature at which the water vapor in the air becomes saturated and condensation begins. When water enters the atmosphere at a temperature below its boiling point. 23. How to convert Fahrenheit to Celsius? 24. What is the first law of thermodynamics? Energy cannot be created nor destroyed. Energy gain by a substance = energy lost by surroundings. 25. What is fluid dynamics? The pressure exerted by a liquid in motion depends on the nature of the flow itself. 26. What is gaseous diffusion? The movement of molecules from areas of high concentration to areas of lower concentration. 27. What is Graham’s Law? The rate of effusion of a gas is inversely proportional to the square root of its molar mass. 28. What is Guy-Lussac’s Law? The pressure exerted by a gas varies directly with its absolute temperature. 29. What is Henry’s Law? 30. What is the kinetic activity of gases? Gas molecules travel at high speeds in random fashion with frequent collisions. The velocity of gas molecules is directly proportional to its temperature. 31. What is Kinetic energy? Energy an object has due to its motion. 32. What is laminar flow? Fluid moving in discrete cylindrical layers or streamlines. 33. What is the melting point? The temperature at which melting occurs. 34. What is partial pressure? The pressure exerted by a single gas in a gas mixture. 35. What is Pascal’s law? Pressure depends on depth and density. 36. What is percent body humidity? The ratio of the amount of water vapor in a volume of gas compared to the amount of the water in gas saturated at a normal body temperature of 37* C.
37. What is Poiseuille’s Law? Predicts the pressure required to produce a given flow. 38. What is potential energy? 39. What is relative humidity? The ratio of the amount of water in the air at a given temperature to the maximum amount it could hold at that temperature. Causes a progressive decrease in fluid pressure as the fluid flows through a tube. 41. What does STPD stand for? 42. What is surface tension? A force exerted by like molecules at a liquid’s surface. It is a measure of how difficult it is to stretch or break the surface of a liquid. 43. What is thermal conductivity? The ability of an object to transfer heat. 44. What are the three states of matter? 45. What is turbulent flow? Loss of regular streamlines; fluid molecules form irregular currents in a chaotic pattern. The change of state from a liquid to a gas. 47. What is the viscosity of liquids? 48. What is water vapor pressure? The atmospheric pressure exerted by the water vapor in the air. It increases as the water vapor in air increases. 49. What are the subjects of thermodynamics? (1) Science – studying the properties of matter at various temperatures. 2. Kinetics – (speed) of reactions of matter at various temperatures. 50. What are the two types of vapor? (1) Boiling Point, and (2) Evaporation. 51. What are the 3 physical principles that describe how energy is handled and transferred? (1) Conservation of Energy. (2) Thermodynamic Equilibrium. (3) Impossibility of Achieving Absolute Zero. 52. What is Absolute Zero? It is the lowest temperature theoretically attainable (at which the kinetic energy of atoms and molecules is minimal). The temperature at which no kinetic energy exists. Molecules cease to vibrate; object has no measurable heat. It has not actually been achieved. 53. What is Archimedes’ Principle? The buoyant force on an object is equal to the weight of the fluid displaced by the object. The property of something weightless and insubstantial. Occurs because pressure below submerged objects always exceeds pressure above the object. Gases also exert buoyant forces. Helps keep solid particles suspended in gases (aerosols). 54. What is the Bernoulli Effect? As the velocity of airflow increases, pressure decreases with total energy remaining constant. Fluid passing through a tube that meets constriction experiences significant pressure drop. Fluid that flows through constriction increases it’s velocity while lateral wall pressure decreases. 55. What is Boyle’s Law? The relationship between the pressure and volume of a gas at constant temperature; when volume increase, pressure decreases. Metric unit for measuring temperature. On this scale water freezes at zero and boils at 100. At -273 degrees C is where kinetic molecular activity stops which is equal to 0 K.
57. What is Charles Law? A principle that describes the relationship between the temperature and volume of a gas at constant pressure. Volume of a gas varies directly with its temperature. If the temperature goes up, so does volume. If it goes down, so does the volume. Mixing of fluid molecules at different temperatures. Transfers heat in liquids and gases (e.g. forced air heating in homes-fluid movements carry heat). The ratio of a gas’ mass to its volume. A thermodynamic quantity representing the amount of energy in a system that is no longer available for doing mechanical work. Amount of energy in a system not available for work. Lowest amount of organization system can achieve. A temperature scale where 32 is freezing and 212 is boiling. 62. What are flow patterns? The pattern that flow occurs, along with its shape. 63. What is fluid dynamics? The pressure exerted by a liquid in motion depends on nature of flow itself. Progressive decrease in fluid pressure occurs as fluid flows through tube due to resistance. 64. Fluid’s viscosity is directly proportional to what? The cohesive forces between its molecules. They have no fixed volume or shape; weak attractive forces. Gas molecules exhibit rapid, random motion with frequent collisions. When these molecules collide they tend to bounce off of each other rather than attach to one another. 66. The heart must use more energy when? When blood viscosity increases, as occurs in polycythemia (increase in red blood cell concentration). 67. What are the four ways that heat transfer can occur? Conduction, Convection, Radiation, or Evaporation/Condensation. 68. What are the patterns of flow? Laminar Flow and Turbulent Flow. 69. Plasma is a combo of what? Neural atoms, free electrons, and atomic nuclei. 70. What is Poiseuille’s Law? The relationship between the pressure, volume, and temperature of a fixed amount of gas; it predicts the pressure required to produce given flow. A disorder characterized by an abnormal increase in the number of red blood cells in the blood. 72. What is potential energy? Energy of position (attractive forces between molecules). Weak in gas state. Makes up most of internal energy in solids and liquids. 73. The Second Law of Thermodynamics is called conservation of energy and is described as? The energy cannot be created, nor destroyed. 74. What are the states of matter? 75. The stronger the cohesive forces the greater the? 76. What is Thermal Conductivity? The ability of an object to transfer heat. A measure to quantify heat transfer between objects. 77. What is radiation heat transfer? Heat transfer that occurs without direct physical contact. 78. Air that is fully saturated with water vapor at 37 degrees Celsius has a water vapor pressure of 47 mmHg and an absolute humidity of what? 79. The degrees Kelvin = degrees Celsius + what? 80. What is the lowest possible temperature that can be achieved and there is no kinetic energy? 81. What is the attractive force between unlike molecules? 82. What is the law that states that the 1-g atomic weight of any substance contains exactly the same number of atoms, molecules, or ions? 83. When a fluid flows through a tube of uniform diameter, pressure decreases progressively over the tube length? 84. What is the temperature at which vapor pressure of a liquid exceeds the atmospheric pressure? 85. Archimedes’ principle explains the difference in liquid pressure that creates an upward or supporting force. What is this called? 86. A phenomenon in which liquid in a small tube moves upward against gravity? 87. What is the change of state from a gas to a liquid called? 88. What is the transfer of heat by direct contact? 89. What is the law stating that the total pressure of a mixture of gases must equal the sum of the partial pressures of all component gases? 90. What is the ratio of the mass of a substance to its volume? 91. What is the term for the amount of energy in a system that is unavailable for work? 92. What is the law that states that the rate of diffusion of a gas is inversely proportional to the square root of its gram molecular weight? 93. The pressure exerted by a liquid depends on what 2 factors? Height and weight density (weight per unit volume). 94. What is the law that states the volume of a gas that dissolves in a liquid is equal to its solubility coefficient times its partial pressure? 95. What is the study of fluids in motion? 96. What is the energy of motion? 97. In this type of flow, a fluid moves in cylindrical layers, or streamlines? 98. According to this law, the pressure varies directly with the surface tension of the liquid and inversely with its radius? 99. What principle explains that the pressure of a given liquid is the same at any specific depth regardless of the container’s shape because the pressure of a liquid acts equally in all directions? 100. The volume of a gas that will dissolve in 1 ml of a given liquid at standard pressure and specified temperature is called what? And that wraps up our study guide on the Physical Principles of Respiratory Care. You can use these practice questions to help prepare for your exams. I really appreciate you taking the time to read all the way to the end. That tells me that you are willing to put in the work — to do whatever it takes to be successful. And you are exactly the type of person I want in the Respiratory Therapy Zone community, so again, thank you. Breathe easy, my friend.